The Garden Patch is a community-driven urban agriculture project sponsored by the Saskatoon Food Bank & Learning Centre. Four years ago, the Saskatoon Food Bank & Learning Centre was granted access to a 1.5 acre vacant city-owned lot on the 900 block of 3rd Avenue North, just south of 33rd Street. Each year this lot is transformed into a vibrant garden. Food is grown by volunteers and all produce is distributed through the Saskatoon Food Bank. In just four years, the Garden Patch has produced approximately 75,000 pounds of food. One of the logistical issues we face at the Garden Patch is the problem of how to transport the produce from the garden to the Food Bank. For many of the vegetables, it is imperative that they are not kept in the hot sun once harvested. In the past we have had to rely on the Food Bank Hino truck to transport the produce. When the amount of food harvested is significant, the use of the truck is very helpful, but for the most part the amount we need to transport is just one or two garbage bag-sized sacks of produce a couple of times each week. The practice of using the truck to transport such a small amount of food is very inefficient and costly in terms of environmental impact and the staff and monetary resources it requires. In the spring  we applied to EcoFriendly Sask for funds to purchase a cargo bike to enable us to transport the produce more efficiently. We were thrilled by the quick response and enthusiastic support we received from EcoFriendly Sask! We were pleased to share the news on our website and with social media followers (Facebook and Twitter). We were able to purchase a suitable bike from Escape Sports and work with Core Neighbourhood Youth Coop (CNYC) to retrofit it to suit our purposes. 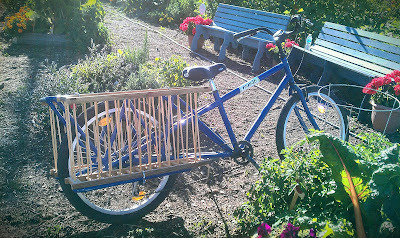 The Garden Patch cargo bike was used for the transport of fresh produce from the garden to the Food Bank where it could be distributed to the community. It allowed us to eliminate car transport for smaller daily harvests. It also allowed our staff to have quick transport between the Food Bank and the Garden Patch. The common reaction from the community is surprise, followed by a smile, and appreciation for the utility of pedal-powered transport. 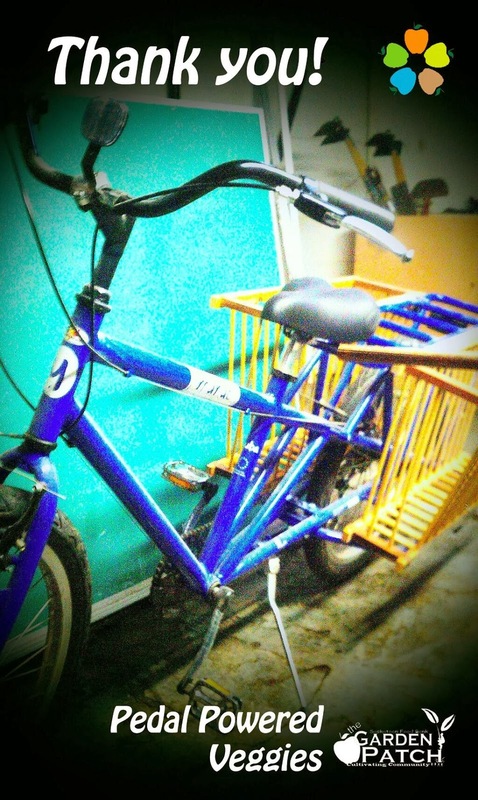 We see bicycle transport playing a critical role in our promotional goals as well as a vegetable transport system for many years. Cargo bike transport continues to be a growing trend among food gardens in cities across the continent, and we are happy to be part of this eco-friendly movement. It has been an empowering experience to become independently mobile at the Garden Patch. We ride with pride!